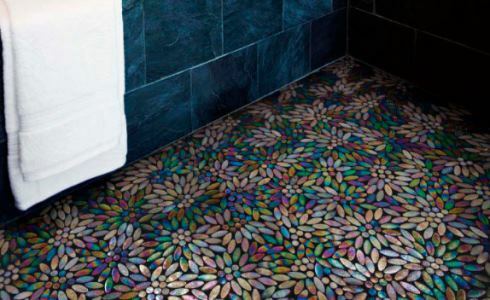 The floor tile design ideas featured here are bound to inspire you . . . . . and get those creative juices flowing. 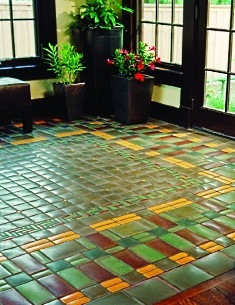 Outstanding examples by some of today's leading tile makers offer looks ranging from classic to casual. A richly diverse array of patterns and colors provides an exciting palette of possibilities for your next project! 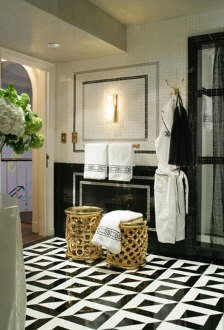 The elegance of black and white checkered floor tile designs is as appealing today as ever. 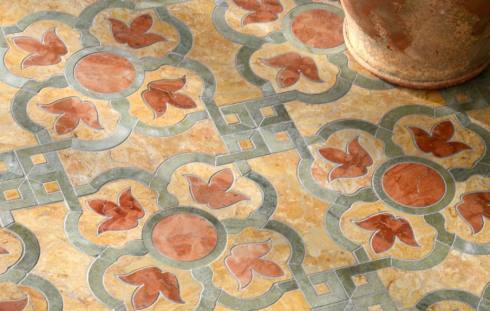 Having withstood a test of time spanning several centuries, this enduring floor tile pattern is truly a classic! Commonly called chessboard or checkerboard tiles, the designs traditionally consist of alternating black and white squares of equal size, frequently arranged in a diagonal pattern. Pictured below is a superb present-day example. 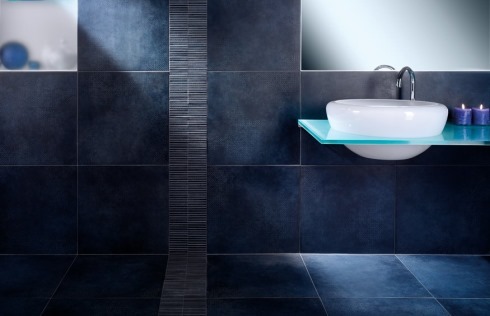 From the "New Tradition" series by Villeroy & Boch, the tiles are made of glazed porcelain stoneware. 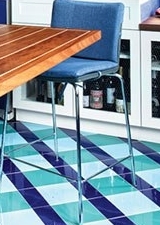 Employing an identical color scheme while altering the tile format yields a dramatically different look. The use of rectangular tiles lends contemporary flair to a classic theme, as shown in the following example from Villeroy & Boch's "Tribute" series. 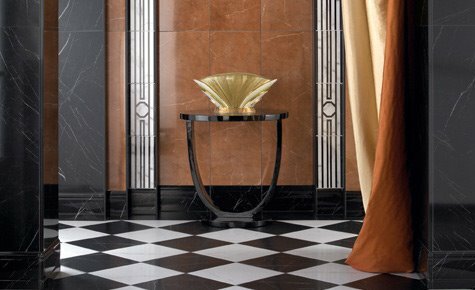 The extraordinary beauty of glass tiles is borne out in a pair of designs from Sicis. The Italian design and manufacturing firm's "Neoglass Mosaic Collection" features gem-like pieces of vividly colored glass. 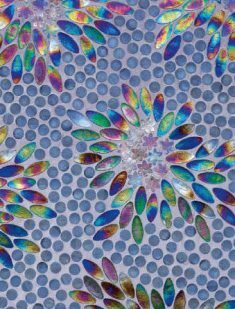 Similarly, like a sea of shimmering jewels under a moonlit sky, the bathroom floor tile design pic- tured below is infused with incredible depth of color, as if it were created by Mother Nature, Herself! Imparting a more earthy look, "Jaen" (below) is a striking natural stone floor tile design from New Ravenna Mosaics' "Miraflores Collection." Created by designer Paul Schatz, the collection was inspired by Spanish, Portugese, Mexican, Moroccan and Middle Eastern motifs. 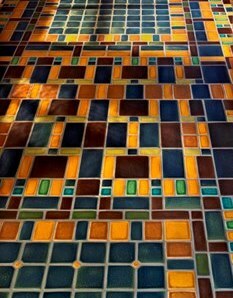 The Arts and Crafts Movement is alive and well in 21st century America with these alluring floor tile design ideas from Motawi Tileworks. 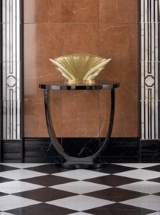 Reflecting the beauty and craftsmanship of an earlier era, each tile is made via a painstaking multi-step process of hand glazing and finishing. 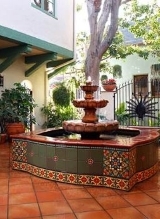 When the pieces are completed and brought together, a vibrant ceramic tile pattern emerges, pulsating with exuberant color and contrast, as shown at right. Another striking example of the firm's work follows. 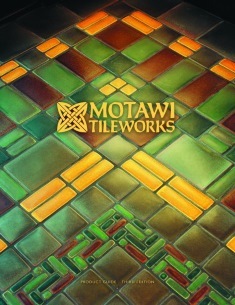 Subtle variations in shading and surface contour -- more clearly visible in the close-up below, left -- demonstrate Motawi's extraordinary attention to detail. The ageless appeal of travertine makes it ideal for tile floor designs. A natural stone with earthy tones of white, cream and tan, travertine has been used as a building material for millenia and works well in virtually any setting. 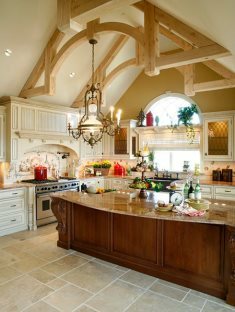 "Travertine Ivory" anchors a striking traditional kitchen design by Ziering Interiors (right). Laid in a random pattern of rectangles and squares of varying sizes, the pavers are from Artistic Tile's "Natural Stone Collection." 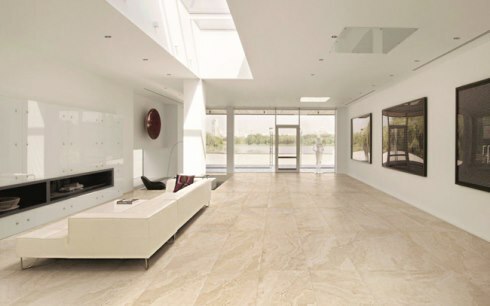 From a design standpoint, travertine works equally well in contemporary settings. 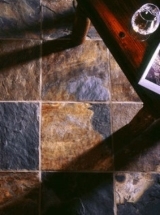 The natural stone's appearance is beautifully replicated in a collection of porcelain tiles from Artistic Tile. "Vanilla Travolini," shown below, features a patina of matte and gloss for added depth. The 12 x 24 inch tiles are placed end to end to accentuate the room's clean lines. An intriguing interplay of light and shadow evokes mystery in a contemporary bathroom tile design. From Cerdomus Ceramics' "Metalskin" series, the 20 x 20 inch tiles feature lightly textured surfaces, shown here in blue naturale. 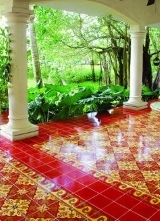 Please check back often or subscribe to our RSS feed, as we frequently add new floor tile design ideas to our site.